Alexander TR (1967) Effect of Hurricane Betsy on the southeastern Everglades. Quarterly Journal of the Florida Academy of Sciences 30: 10-24. Allen JA, Ewel KC, Keeland BD, Tara T, and Smith TJ (2000) Downed wood in Micronesian mangrove forests. Wetlands 20: 169-176. Alongi DM, Christoffersen P, Tirendi F, and Robertson AI (1992) The influence of freshwater and material export on sedimentary facies and benthic processes within the Fly Delta and adjacent Gulf of Papua (Papua New Guinea). Continental Shelf Research 12: 287-326. Bacon PR (1990) The ecology and management of swamp forests in the Guianas and Caribbean region. In: Lugo AE, Brinson M, and Brown S (eds.) Ecosystems of the World 15: Forested Wetlands, pp. 213-250. Amsterdam: Elsevier Press. Bacon PR (1994) Template for evaluation of impacts of sea level rise on Caribbean coastal wetlands. Ecological Engineering 3: 171-186. Baldwin A, Egnotovich M, Ford M, and Platt W (2001) Regeneration in fringe mangrove forests damaged by Hurricane Andrew. Plant Ecology 157: 151-164. Ball MC (1980) Patterns of secondary succession in a mangrove forest of southern Florida. Oecologia 44: 226-235. Ball MC (1988) Ecophysiology of mangroves. Trees 2: 129-142. Berger U and Hildenbrandt H (2000) A new approach to spatially explicit modelling of forest dynamics: Spacing, ageing and neighborhood competition of mangrove trees. Ecological Modelling 132: 287-302. Blasco F (1984) Climatic factors and the biology of mangrove plants. In: Snedaker SC and Snedaker JG (eds.) The Mangrove Ecosystem: Research Methods, pp. 18-35. Paris: UNESCO. Botero L (1990) Massive mangrove mortality on the Caribbean coast of Colombia. Vida Silvestre Neotropical 2: 77-78. Boto KG, Saffingna P, and Clough B (1985) Role of nitrate in nitrogen nutrition of the mangrove Avicennia Marina. Marine Ecology Progress Series 21: 259-265. Boto KG and Wellington JT (1988) Seasonal variations in concentrations and fluxes of dissolved organic and inorganic materials in a tropical, tidally-dominated, mangrove waterway. Marine Ecology Progress Series 50: 151-160. Brown S and Lugo AE (1994) Rehabilitation of tropical lands: A key to sustaining development. Restoration Ecology 2: 97-111. Camilleri JC (1992) Leaf-litter processing by invertebrates in a mangrove forest in Queensland. Marine Biology 114: 139-145. Carlton JM (1974) Land-building and stabilization by mangroves. Environmental Conservation 1: 285. Chapman VJ (1976) Mangrove Vegetation. Vaduz, Germany: J. Cramer. Chen R and Twilley RR (1998) A gap dynamic model of mangrove forest development along gradients of soil salinity and nutrient resources. Journal of Ecology 86: 1-12. Chen R and Twilley RR (1998) A simulation model of organic matter and nutrient accumulation in mangrove wetland soils. Biogeochemistry 44: 93-118. Chen R and Twilley RR (1999) Patterns of mangrove forest structure and soil nutrient dynamics along the Shark River Estuary, Florida. Estuaries 22: 955-970. Cintron G (1990) Restoration of mangrove systems. Symposium on Habitat Restoration. Washington, DC: National Oceanic and Atmospheric Administration. Cintron G, Lugo AE, Martinez R, Cintron BB, and Encarnacion L (1981) Impact of oil in the tropical marine environment, pp. 18-27. Technical Publication. Division of Marine Resources, Department of Natural Resources of Puerto Rico. Corredor JE and Morell MJ (1994) Nitrate depuration of secondary sewage effluents in mangrove sediments. Estuaries 17: 295-300. Craighead FC and Gilbert VC (1962) The effects of Hurricane Donna on the vegetation of southern Florida. Quarterly Journal of the Florida Academy of Sciences 25: 1-28. Davis JH (1940) The ecology and geologic role of mangroves in Florida. In: Carnegie Institution, Publication No. 517, pp. 303-412. Washington, DC: Carneigie Institution. Davis S, Childers DL, Day JWJ, Rudnick D, and Sklar F (2001) Wetland-water column exchanges of carbon, nitrogen, and phosphorus in a southern everglades dwarf mangrove. Estuaries 24: 610-622. Davis S, Childers DL, Day JW, Rudnick D, and Sklar F (2003) Factors affecting the concentration and flux of materials in two southern everglades mangrove wetlands. Marine Ecology Progress Series 253: 85-96. Duke NC (2001) Gap creation and regenerative process driving diversity and structure of mangrove ecosystems. Wetlands Ecology and Management 9: 257-269. Duke NC and Pinzon Z (1993) Mangrove forests. In: Keller BD and Jackson JBC (eds.) Long-Term Assessment of the Oil Spill at Bahia las Minas, Panama, Synthesis Report, Volumn II, Technical Report, pp. 447-553. New Orleans, LA: US Dept of the Interior, Minerals Management Service, Gulf of Mexico OCS Regional Office. Ellison jC (1993) Mangrove retreat with rising sea-level Bermuda. Estuarine, Coastal and Shelf Science 37: 75-87. Ellison AM (2000) Mangrove restoration: Do we know enough? Restoration Ecology 8: 219-229. Ellison AM and Farnsworth EJ (1992) The ecology of Belizean mangrove-root fouling communities: Patterns of epibiont distribution and abundance, and effects on root growth. Hydrobiologia 20: 1-12. Ellison JC and Stoddart DR (1991) Mangrove ecosystem collapse during predicted sea-level rise: Holocene analogues and implications. Journal of Coastal Research 7: 151-165. Ewe SML, Gaiser EE, Childers DL, et al. (2006) Spatial and temporal patterns of aboveground net primary productivity (ANPP) in the Florida Coastal Everglades. Hydrobiologia 569: 459-474. Ewel KC, Ong JE, and Twilley R (1998) Different kinds of mangrove swamps provide different goods and services. Global Ecology and Biogeography Letters 7: 83-94. Ewel KC, Zheng SF, Pinzon ZS, and Bourgeois JA (1998) Environmental effects of canopy gap formation in high-rainfall mangrove forests. Biotropica 30: 510-518. Farnsworth EJ and Ellison AM (1991) Patterns of herbivory in Belizean mangrove swamps. Biotropica 23: 555-567. Farnsworth EJ and Ellison AM (1993) Dynamics of herbivory in Belizean mangal. Journal of Tropical Ecology 9: 435-453. Farquhar GD, Ball MC, von Caemmerer S, and Roksandic Z (1982) Effect of salinity and humidity on <513C values of halophytes -evidence for diffusional isotope fractionation determined by the ratios of intercellular/atmospheric CO2 under different environmental conditions. Oecologia (Berlin) 52: 121-137. Fell JW and Master IM (1973) Fungi associated with the degradation of mangrove (Rhizophora mangle L.) leaves in south Florida. In: Stevenson LH and Colwell RR (eds.) Estuarine Microbial Ecology, pp. 455-465. Columbia, SC: University of South Carolina Press. Herbivory of Dwarf Red mangrove. PhD Dissertation, Georgetown University. Feller IC (1995) Effects of nutrient enrichment on growth and herbivory of dwarf red mangrove (Rhizophora mangle). Ecological Monographs 65: 477-505. Feller IC and McKee KL (1999) Small gap creation in Belizean mangrove forests by a wood-boring insect. Biotropica 31: 607-617. Feller IC, Whigham DF, McKee KL, and Lovelock CE (2003) Nitrogen limitation of growth and nutrient dynamics in a disturbed mangrove forest, Indian River Lagoon, Florida. Oecologia 134: 405-414. Feller IC, Whigham DF, O'Neill JP, and McKee KL (1999) Effects of nutrient enrichment on within-stand cycling in a mangrove forest. Ecology 80: 2193-2205. Field CD (1996) Restoration of mangrove ecosystems. In: International Society for Mangrove Ecosystems. Hong Kong: South China Printing. Fry B, Bern AL, Ross MS, and Meeder JF (2000) <515N studies of nitrogen use by the red mangrove, Rhizophora mangle L., in south Florida. Estuarine, Coastal and Shelf Science 50: 723-735. Fry B and Smith TJ, III (2002) Stable isotope studies of red mangroves and filter feeders from the Shark River estuary, Florida. Bulletin of Marine Sciences 70: 871-890. Garrity SD, Levings SC, and Burns KA (1994) The Galeta oil spill. I. Long-term effects on the physical structure of the mangrove fringe. Estuarine, Coastal and Shelf Science 38: 327-348. Getter CD, Scott GI, and Michel J (1981) The effects of oil spills on mangrove forests: A comparison of five oil spill sites in the Gulf of Mexico and the Caribbean Sea. Proceedings of the 1981 Oil Spill Conference, pp. 65-11. Washington, DC: API/EPA/USCG. Gilmore RG, Jr. and Snedaker SC (1993) Mangrove forests. In: Martin WH, Boyce SG, and Echternacht AC (eds.) Biodiversity of the Southeastern United States/Lowland Terrestrial Communities, pp. 165-198. New York: Wiley. Glynn PW, Almodovar LR, and Gonzalez JG (1964) Effects of hurricane Edith on marine life in La Parguera, Pueto Rico. Caribbean Journal of Science 4: 335-345. Gosselink JG and Turner RE (1978) The role of hydrology in freshwater wetland ecosystems. In: Good DFWRE and Simpson RL (eds.) Freshwater Wetlands: Ecological Processes and Management Potential, pp. 633-678. New York: Academic Press. Hedgpeth JW (1957) Classification of marine environments. Geological Society of America, Memoir 67(1): 17-28. Huston MA (1994) Biological Diversity. Cambridge: Cambridge University Press. Iizumi H (1986) Soil nutrient dynamics. In: Cragg S and Polunin N (eds.) Workshop on Mangrove Ecosystem Dynamics, p.171. New Delhi: UNDP/UNESCO Regional Project (RAS/79/002). Jones DA (1984) Crabs of the mangal ecosystem. In: Por FD and Dor I (eds.) Hydrobiology of the Mangal, pp. 89-109. The Hague: Dr. W. Junk Publishers. Koch MS and Snedaker SC (1997) Factors influencing Rhizophora mangle L. seedlings development into the sapling stage across resource and stress gradients in subtropical Florida. Biotropica 29: 427-439. Krauss KW, Allen JA, and Cahoon DR (2003) Differential rates of vertical accretion and elevation change among aerial root types in Micronesian mangrove forests. Estuarine Coastal and Shelf Science 56: 251-259. Krauss KW, Doyle TW, Twilley RR, Smith TJ, Whelan KRT, and Sullivan JK (2005) Woody debris in the mangrove forests of south Florida. Biotropica 37: 9-15. Kristensen E, Andersen F0, and Kofoed LH (1988) Preliminary assessment of benthic community metabolism in a Southeast Asian mangrove swamp. Marine Ecology Progress Series 48: 137-145. Lee SY (1989) Litter production and turnover of the mangrove Kandelia candel (L.) Druce in a Hong Kong tidal shrimp pond. Estuarine, Coastal and Shelf Science 29: 75-87. Leh CMU and Sasekumar A (1985) The food of sesarmid crabs in Malaysian mangrove forests. Malay Naturalist Journal 39: 135-145. Lewis RR (1982) Mangrove forests. In: Lewis RR (ed.) Creation and Restoration of Coastal Plant Communities, pp. 153-171. Boca Raton, FL: CRC Press. Lewis RR (1990) Creation and restoration of coastal plain wetlands in Florida. In: Kusler JA and Kentula ME (eds.) Wetland Creation and Restoration, pp. 73-101. Washington, DC: Island Press. Lewis RR (1990) Creation and restoration of coastal wetlands in Puerto Rico and the US Virgin Islands. In: Kusler JA and Kentula ME (eds.) Wetland Creation and Restoration, pp. 103-123. Washington, DC: Island Press. Lin G and Sternberg LSL (1992) Differences in morphology, carbon isotope ratios, and photosynthesis between scrub and fringe mangroves in Florida, USA. Aquatic Botany 42: 303-313. Lin G and Sternberg LSL (1992) Effect of growth form, salinity, nutrient and sulfide on photosynthesis, carbon isotope discrimination and growth of red mangrove (Rhizophora mangle L.). Australian Journal of Plant Physiology 19: 509-517. Lovelock CE, Feller IC, Mckee KL, Engelbrecht BMJ, and Ball MC (2004) The effect of nutrient enrichment on growth, photosynthesis and hydraulic conductance of dwarf mangroves in Panama. Functional Ecology 18: 25-33. Lugo AE (1980) Mangrove ecosystems: Successional or steady state? Biotropica 12: 65-72. Lugo AE (1998) Mangrove forests: A tough system to invade but an easy one to rehabilitate. Marine Pollution Bulletin 37: 427-430. Lugo AE and Snedaker SC (1974) The ecology of mangroves. Annual Review of Ecology and Systematics 5: 39-64. Lynch JC, Meriwether JR, McKee BA, Vera-Herrera F, and Twilley RR (1989) Recent accretion in mangrove ecosystems based on 137Cs and 210Pb. Estuaries 12: 284-299. Macnae W (1968) A general account of the fauna and flora of mangrove swamps and forests in the Indo-West-Pacific region. Advances in Marine Biology 6: 73-270. Malley DF (1978) Degradation of mangrove leaf litter by the tropical sesarmid crab Chiromanthes onychophorum. Marine Biology 49: 377-386. McKee KL (1993) Soil physicochemical patterns and mangrove species distribution - Reciprocal effects? Journal of Ecology 81: 477-487. McKee KL, Feller IC, Popp M, and Wanek W (2002) Mangrove isotopic (<515N and <513C) fractionation across a nitrogen vs. phosphorus limitation gradient. Ecology 83: 1065-1075. Medina E and Francisco M (1997) Osmolality and <513C of leaf tissues of mangrove species from environments of contrasting rainfall and salinity. Estuarine, Coastal and Shelf Science 45: 337-344. Naidoo G (1985) Effects of waterlogging and salinity on plant-water relations and on the accumulation of solutes in three mangrove species. Aquatic Botany 22: 133-143. Nedwell DB (1975) Inorganic nitrogen metabolism in a eutrophicated tropical mangrove estuary. Water Research 9: 221-231. Nixon SW (1980) Between coastal marshes and coastal waters - A review of twenty years of speculation and research on the role of salt marshes in estuarine productivity and water chemistry. In: Hamilton P and MacDonald KB (eds.) Estuarine and Wetland Processes with Emphasis on Modeling, pp. 437-525. New York: Plenum Press. Odum WE and Heald EJ (1972) Trophic analysis of an estuarine mangrove community. Bulletin Marine Science 22: 671-738. Odum WE and McIvorCC (1990) Mangroves. In: Myers RL and Ewel JJ (eds.) Ecosystems of Florida, pp. 517-548. Orlando, FL: University of Central Florida Press. Mangroves of South Florida: A Community Profile. FWS/OBS-81/24. Washington, DC: US Fish and Wildlife Service, Office of Biological Resources. Parkinson RW, DeLaune RD, and White JR (1994) Holocene sea-level rise and the fate of mangrove forests within the wider Caribbean region. Journal of Coastal Research 10: 1077-1086. Pinzon ZS, Ewel KC, and Putz FE (2003) Gap formation and forest regeneration in a Micronesian mangrove forest. Journal of Tropical Ecology 19: 143-153. Ponnamperuma FN (1984) Mangrove swamps in south and Southeast Asia as potential rice lands. In: Soepadmo E, Rao AN, and McIntosh DJ (eds.) Proceedings Asian Mangrove Symposium, pp. 672-683. Kuala Lumpur: University of Malaya. Pool DJ, Lugo AE, and Snedaker SC (1975) Litter production in mangrove forests of southern Florida and Puerto Rico. In: Walsh G, Snedaker S, and Teas H (eds.) Proceedings of the International Symposium on the Biology and Management of Mangroves, pp. 213-237. Gainesville, FL: Institute of Food and Agricultural Sciences. University of Florida. Rabinowitz D (1978) Early growth of mangrove seedlings in Panama, and an hypothesis concerning the relationship of dispersal and zonation. Journal of Biogeography 5: 113-133. Rivera-Monroy VH, Day JW, Twilley RR, Vera-Herrera F, and Coronado-Molina C (1995) Flux of nitrogen and sediment in a fringe mangrove forest in Terminos Lagoon, Mexico. Estuarine, Coastal and Shelf Science 40: 139-160. Rivera-Monroy VH and Twilley RR (1996) The relative role of denitrification and immobilization in the fate of inorganic nitrogen in mangrove sediments. Limnology and Oceanography 41: 284-296. Rivera-Monroy VH, Twilley RR, Boustany RG, Day JW, Vera-Herrera F, and Ramirez MdC (1995) Direct denitrification in mangrove sediments in Terminos Lagoon, Mexico. Marine Ecology Progress Series 97: 97-109. Rivera-Monroy VH, Twilley RR, Bone D, et al. (2004) A conceptual framework to develop long-term ecological research and management objectives in the wider Caribbean region. Bioscience 54: 843-856. Robertson AI (1986) Leaf-burying crabs: Their influence on energy flow and export from mixed mangrove forests (Rhizophora spp.) in northeastern Australia. Journal of Experimental Marine Biology and Ecology 102: 237-248. Robertson AI and Alongi DM (1992) Tropical Mangrove Ecosystems, vol. 41. Washington, DC: American Geophysical Union. Robertson AI, Alongi DM, and Boto KG (1992) Food chains and carbon fluxes. In: Robertson AI and Alongi DM (eds.) Tropical Mangrove Ecosystems, pp. 293-326. Washington, DC: American Geophysical Union. 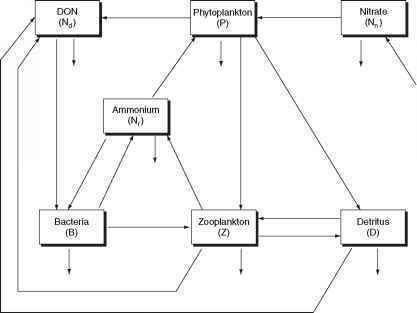 Robertson AI and Blaber SJM (1992) Plankton, epibenthos and fish communities. In: Robertson AI and Alongi DM (eds.) Tropical Mangrove Ecosystems, pp. 173-224. Washington, DC: American Geophysical Union. Robertson AI and Daniel PA (1989) The influence of crabs on litter processing in high intertidal mangrove forests in tropical Australia. Oecologia 78: 191-198. Robertson AI and Duke NC (1990) Mangrove fish-communities in tropical Queensland, Australia: Spatial and temporal patterns in densities, biomass and community structure. Marine Biology 104: 369-379. Rodelli MR, Gearing JN, Gearing PJ, Marshall N, and Sasekumar A (1984) Stable isotope ratio as a tracer of mangrove carbon in Malaysian ecosystems. Oecologia 61: 326-333. Rojas-Galaviz JL, Yanez-Arancibia A, Day JW, Jr., and Vera-Herrera FR (1992) Estuarine primary producers: Laguna de Terminos-a study case. In: Seeliger U (ed.) Coastal Plant Communities of Latin America, pp. 141-154. San Diego, CA: Academic Press. Romero LM, Smith TJ, and Fourqurean JW (2005) Changes in mass and nutrient content of wood during decomposition in a south Florida mangrove forest. Journal of Ecology 93: 618-631. Ross MS, Meeder JF, Sah JP, Ruiz LP, and Telesnicki GJ (2000) The Southeast saline Everglades revisited: 50 Years of coastal vegetation change. Journal of Vegetation Science 11: 101-112. Roth LC (1992) Hurricanes and mangrove regeneration: Effects of Hurricane Juan, October 1988, on the vegetation of Isla del Venado, Bluefields, Nicaragua. Biotropica 24: 375-384. Rutzler Kand Feller C (1988) Mangrove swamp communities. Oceanus 30: 16-24. Rutzler Kand Feller C (1996) Carribbean mangrove swamps. Scientific American 274: 94-99. Saenger P, Hegerl EJ, and Davie JDS (1983) Global Status of Mangrove Ecosystems. Commission on Ecology Paper No. 3, pp. 83. International Union for the Conservation of Nature (IUCN). Saenger P and Snedaker SC (1993) Pantropical trends in mangrove above-ground biomass and annual litterfall. Oecologia 96: 293-299. Sauer JD (1962) Effects of recent tropical cyclones on the coastal vegetation of Mauritius. Journal of Ecology 50: 275-290. Scholander PF, Hammel HT, Hemmingsen E, and Garay W (1962) Salt balance in mangroves. Plant Physiology 37: 722-729. Sherman RE, FaheyTJ, and Battles JJ (2000) Small-scale disturbance and regeneration dynamics in a neotropical mangrove forest. Journal of Ecology 88: 165-178. Simberloff DS and Wilson EO (1969) Experimental zoogeography of islands: The colonization of empty islands. Ecology 50: 278-289. Smith TJ, III (1987) Seed predation in relation to tree dominance and distribution in mangrove forests. Ecology 68: 266-273. Smith TJ, III (1992) Forest structure. In: Robertson AI and Alongi DM (eds.) Tropical Mangrove Ecosystems, pp. 101-136. Washington, DC: American Geophysical Union. Smith TJ, Boto KG, Frusher SD, and Giddins RL (1991) Keystone species and mangrove forest dynamics: The influence of burrowing by crabs on soil nutrient status and forest productivity. Estuarine Coastal and Shelf Science 33: 419-432. Smith TJ, III, Robblee MB, Wanless HR, and Doyle TW (1994) Mangroves, hurricanes, and lightning strikes. BioScience 44: 256-262. Snedaker S (1982) Mangrove species zonation: Why? In: Sen DN and Rajpurohit KS (eds.) Tasks for Vegetation Science, vol. 2, pp. 111-125. The Hague: Junk. Snedaker SC (1986) Traditional uses of South American mangrove resources and the socio-economic effect of ecosystem changes. In: Kunstadter P, Bird ECF, and Sabhasri S (eds.) Proceedings, Workshop on Man in the Mangroves, pp. 104-112. Tokyo: United Nations University. Snedaker SC (1989) Overview of ecology of mangroves and information needs for Florida Bay. Bulletin of Marine Science 44: 341-347. Snedaker SC, Meeder JF, Ross MS, and Ford RG (1994) Discussion of Ellison, JC and Stoddart, DR 1991. Mangrove ecosystem collapse during predicted sea-level rise: Holocene analogues and implications. Journal of Coastal Research 7: 151-165, Journal of Coastal Research 10: 497-498. Snedaker SC and Snedaker JG (1984) The Mangrove Ecosystem: Research Methods. London: UNESCO. Sousa WP, Quek SP, and Mitchell BJ (2003) Regeneration of Rhizophora mangle in a Caribbean mangrove forest: Interacting effects of canopy disturbance and a stem-boring beetle. Oecologia 137: 436-445. Sutherland JP (1980) Dynamics of the epibenthic community on roots of the mangrove Rhizophora mangle, at Bahia de Buche, Venezuela. Marine Biology 58: 75-84. Teas HJ (1981) Restoration of mangrove ecosystems. In: Carey RC, Markovits PS, and Kirkwood JB (eds.) Proceedings of Workshop on Coastal Ecosystems of the Southeastern United States, pp. 95-103. Reno, NV: US Fish and Wildlife Service, Office of Biological Services, FWS/0BS-80/59. Thayer GW, Colby DR, and Hettler WF, Jr. (1987) Utilization of the red mangrove prop root habitat by fishes in south Florida. Marine Ecology Progress Series 35: 25-38. Thom B (1967) Mangrove ecology and deltaic morphology: Tabasco, Mexico. Journal of Ecology 55: 301-343. Thom BG (1982) Mangrove ecology - A geomorphological perspective. In: Clough BF (ed.) Mangrove Ecosystems in Australia, pp. 3-17. Canberra: Australian National University Press. Thom BG (1984) Coastal landforms and geomorphic processes. In: Sneadeker SC and Sneadeker JG (eds.) The Mangrove Ecosystem: Research Methods, pp. 3-17. Paris: UNESCO. Tilman D (1982) Resource Competition. Princeton, NJ: Princeton University Press. Tomlinson PB (1995) The Botany of Mangroves. New York: Cambridge University Press. Twilley RR (1988) Coupling of mangroves to the productivity of estuarine and coastal waters. In: Jansson BO (ed.) Coastal-Offshore Ecosystems: Interactions, pp. 155-180. Berlin: Springer. Twilley RR (1995) Properties of mangroves ecosystems and their relation to the energy signature of coastal environments. In: Hall CAS (ed.) Maximum Power, pp. 43-62. Denver, CO: Colorado Press. Twilley RR (1997) Mangrove wetlands. In: Messina M and Connor W (eds.) Southern Forested Wetlands: Ecology and Management, pp. 445-473. Boca Raton, FL: CRC Press. Twilley RR, Cardenas W, Rivera-Monroy VH, etal. (2000) Ecology of the Gulf of Guayaquil and the Guayas River Estuary. In: Seeliger U and Kjerve BJ (eds.) Coastal Marine Ecosystems of Latin America, pp. 245-263. New York: Springer. Twilley RR and Chen RH (1998) A water budget and hydrology model of a basin mangrove forest in Rookery Bay, Florida. Marine and Freshwater Research 49: 309-323. Twilley RR, Chen RH, and Hargis T (1992) Carbon sinks in mangroves and their implications to carbon budget of tropical coastal ecosystems. Water, Air and Soil Pollution 64: 265-288. Twilley RR, Gottfried RR, Rivera-Monroy VH, Armijos MM, and Bodero A (1998) An approach and preliminary model of integrating ecological and economic constraints of environmental quality in the Guayas River estuary, Ecuador. Environmental Science and Policy 1:271-288. Twilley RR, LugoAE, and Patterson-Zucca C (1986) Production, standing crop, and decomposition of litter in basin mangrove forests in southwest Florida. Ecology 67: 670-683. Twilley RR, Pozo M, Garcia VH, Rivera-Monroy VH, Zambrano R, and Bodero A (1997) Litter dynamics in riverine mangrove forests in the Guayas River estuary, Ecuador. Oecologia 111: 109-122. Twilley RR and Rivera-Monroy VH (2005) Developing performance measures of mangrove wetlands using simulation models of hydrology, nutrient biogeochemistry, and community dynamics. Journal of Coastal Research 40: 79-93. Twilley RR, Rivera-Monroy VH, Chen R, and Botero L (1998) Adapting and ecological mangrove model to simulate trajectories in restoration ecology. Marine Pollution Bulletin 37: 404-419. Twilley RR, Snedaker SC, Yanez-Arancibia A, and Medina E (1996) Biodiversity and ecosystem processes in tropical estuaries: Perspectives from mangrove ecosystems. In: Mooney H, Cushman H, and Medina E (eds.) Biodiversity and Ecosystem Functions: A Global Perspective, pp. 327-370. New York: Wiley. Vermeer DE (1963) Effects of Hurricane Hattie, 1961, on the cays of British Honduras. Zeitschrift fur Geomorphologie 7: 332-354. Wadsworth FH (1959) Growth and regeneration of white mangrove in Puerto Rico. Caribbean Forester 20: 59-69. Waisel Y (1972) Biology of Halophytes, 395pp. New York: Academic Press. Walsh GE (1974) Mangroves: A review. In: Reimold R and Queen W (eds.) Ecology of Halophytes, pp. 51-174. New York: Academic Press. Wanless HR, Parkinson RW, and Tedesco LP (1994) Sea level control on stability of Everglades wetlands. In: Davis S and Ogden J (eds.) Everglades: The Ecosystem and Its Restoration, pp. 199-223. Delray Beach, FL: St. Lucie Press. Watson J (1928) Mangrove Forests of the Malay Peninsula. Singapore: Fraser & Neave. Woodroffe CD (1990) The impact of sea-level rise on mangrove shoreline. Progress in Physical Geography 14: 483-520. Woodroffe C (1992) Mangrove sediments and geomorphology. In: Robertson AI and Alongi DM (eds.) Tropical Mangrove Ecosystems, pp. 7-42. Washington, DC: American Geophysical Union. Geomorphological dynamics and evolution of the South Alligator tidal river and plains. In: ANU, North Australia Research Unit Monograph 3. Darwin: North Australian Research Unit. Yanez-Arancibia A (1985) Fish Community Ecology in Estuaries and Coastal Lagoons: Towards an Ecosystem Integration. Mexico City, UNAM Press. Yanez-Arancibia A and Day JW, Jr. (1982) Ecological characterization of Terminos Lagoon, a tropical lagoon-estuarine system in the Southern Gulf of Mexico. Oceanologica Acta SP: 431-440. Ecosystems in the Southern Gulf of Mexico: The Terminos Lagoon Region. Mexico City: Universidad Nacional Autonoma de Mexico, Ciudad Universitaria, Mexico. Interactions between mangrove and seagrass habitats mediated by estuarine nekton assemblages: Coupling of primary and secondary production. Hydrobiologia 264: 1-12. Yanez-Arancibia A, Lara-Dominguez AL, Rojas-Galaviz JL, et al. (1988) Seasonal biomass and diversity of estuarine fishes coupled with tropical habitat heterogeneity (southern Gulf of Mexico). Journal of Fish Biology 33(supplement A): 191-200.